Sicario is a very big punch to the gut. But one that hits you in a good way. Sicario, as the opening moments of the movie tells us, is the Spanish word for ‘hitman’. The movie follows FBI agent, Kate Macer (Emily Blunt), one who specializes in cases dealing with kidnappings. In the opening scene, her team invades a house tipped off to be holding hostages somewhere in Arizona. Instead of hostages, they find dead bodies strewn up along the house walls – victims of a Mexican drug cartel. It’s a scene none of them are expecting, and we can tell this, because they all discharge to the front yard to vomit. Following this case, Kate is summoned to an FBI office where she is transferred and recruited to be part of a team lead by a Department of Defense consultant named Matt (Josh Brolin). His casual demeanor throws her off and she is unsure of what she’s getting into. Matt’s scope of work is a bit grander than what Kate is used to. He is spearheading missions related to the stoppage of one of the largest Mexican cartels, led by a man named Diaz. They are aided by a shadowy and mysterious figure named Alejandro (Benicio Del Toro), whose level of involvement is unclear. It is clear, however, that his involvement is necessary. On their first mission, Kate is at first told that they are going on a mission in El Paso, Texas. However, it is soon revealed that this was a lie… they are going to Juarez, across the boarder in Mexico. From here on out, Kate has to wade through a myriad of lies to understand what exactly she is getting involved with. Sicario is a powerful film directed by an amazing Canadian director named Denis Villeneuve who did the outstanding Canadian feature, Incendies, the enigmatic, Enemy, and also Prisoners (didn’t catch this one though). Villeneuve seems to have no problem diving and dissecting difficult and oftentimes, uncomfortable subject matter. The story and characters of Sicario are all layered and as the movie progresses, a darker reality is revealed. More than anything, to me, the movie is about the conflict between ideality and reality. One tells us how things ought to be, and the other tells us of how things are carried out in reality. Kate, an upstanding and moral agent represents the ideals that we believe the FBI and Uncle Sam represents. Matt, however comes from the ground up and brings in the reality of the situation. He’s a man that perhaps at an earlier stage in life, was in Kate’s shoes and saw things through a glass dimly. But sometimes the road owns you and likely he learned the lesson that sometimes bullets move faster than bureaucracy. Near the end, the ideals in her literally and figuratively get punched in the gut by reality. The film is surrounded by great performances all around. It’s very hard to tell between Emily Blunt and Benicio Del Toro who had the stronger go around. Each was very effective in their roles. If anything, Blunt’s performance represents one of the strongest female lead roles since Ellen Ripley from Aliens. She’s not a badass like Ripley, but she is strong, and holds her own ground, even when playing with all the big boys in the yard. The movie was shot beautifully by Roger Deakins whose worked with Villeneuve before and also a frequent collaborator on Coen brothers movies. You’ve seen his stuff! He shoots sceneries and landscapes with such a grandiose vision. It feels like your eyes are cutting through butter – it’s that effortless! On top of that, the score by Jóhann Jóhannsson, may have been my favourite things about the movie. It’s a subtle score, and it’s not so much about music as it is ambient sounds that are used to emphasize the darkness that’s revealed with each passing scene. It’s an effective example of how less is sometimes more. The music just accentuated the forebodingness that you knew was coming. I was really interested in seeing Sicario in light of watching Narcos on Netflix earlier this month (write-up likely coming soon), another outing dealing with drug trafficking and cartels. As I was watching Narcos earlier this month, I was wondering what Sicario could do that’s any different. Everything I wanted to see and learn about was all there (in Narcos). However, whereas Narcos gave us a full glimpse on all sides of the drug trafficking scene, Sicario is simply more interested in the stateside affairs. Which leads into the weakest aspect of the movie. 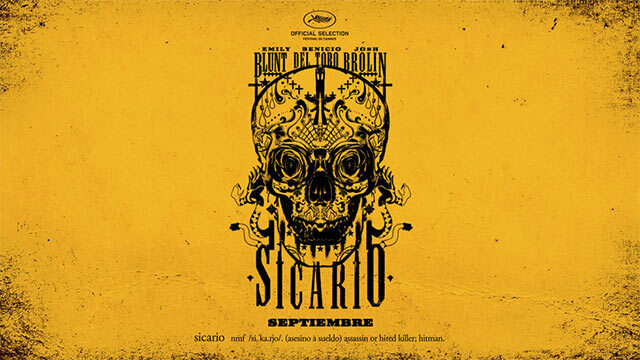 Sicario features a small side story about a Mexican police officer and seeing him take care of his family. It’s very clear where this little story is going, but it never really pays off. There wasn’t really a need for this side story, but perhaps it was used to show the humanity side of the drug traffickers. However, I did like the very last scene and it’s symbolism of how all the drug trafficking conflict is like a soccer game. And like a game, it must continue. I have no doubt that Sicario will be bounced around during Oscar season. It is a solid entry in 2015. Go see it! Until next time, later geeks!